Carrying around resentments and anger is a heavy burden. And usually the only person you’re hurting is yourself, not the person you’re mad at. 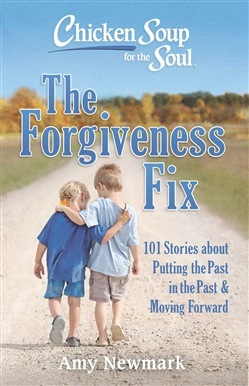 The 101 personal, revealing stories in this collection will give you the tools you need to change your life through forgiveness. Not being able to forgive can leave you emotionally paralyzed. You can’t move on, because you’re stuck in the past. These real-life stories show you how to put the past in the past—where it belongs! So that you can move forward, into your future, without carrying the weight of past disappointments. Forgiveness is the fix for a wide variety of issues, and it’s essential to your happiness. Acquista Chicken Soup for the Soul: The Forgiveness Fix in Epub: dopo aver letto l’ebook Chicken Soup for the Soul: The Forgiveness Fix di Amy Newmark ti invitiamo a lasciarci una Recensione qui sotto: sarà utile agli utenti che non abbiano ancora letto questo libro e che vogliano avere delle opinioni altrui. L’opinione su di un libro è molto soggettiva e per questo leggere eventuali recensioni negative non ci dovrà frenare dall’acquisto, anzi dovrà spingerci ad acquistare il libro in fretta per poter dire la nostra ed eventualmente smentire quanto commentato da altri, contribuendo ad arricchire più possibile i commenti e dare sempre più spunti di confronto al pubblico online.